The Eggrobo in Sonic Generations. 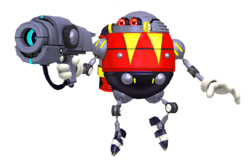 Eggrobos or Egg Robos (エッグロボ, Eggrobo) are enemies from the Sonic games. An Eggrobo as it appears in Sonic & Knuckles. Eggrobos are android badniks built by Dr. Eggman, in his own likeliness. They first appeared in Sonic & Knuckles, as the sole enemy in Sky Sanctuary Zone. After being sent out of the Death Egg, they will hover in place and attack the player character when in proximity, firing at them with its large laser pistol. In the same game, an Eggrobo piloting Dr. Eggman's boss machines is the antagonist in Knuckles' story, replacing Dr. Eggman and acting identically to him. Eggrobos would later appear in Sonic Generations, in Act 2 of Sky Sanctuary Zone, once again as the zone's enemies. While they act similiarly to their original appearance, they now either fire several beams at once, or only fire one at a time, as they did in Sonic & Knuckles. A similar behavior, as well as their design, from Sonic Generations is used for the Eggrobos in Smash 3DS's Smash Run. Other important appearances include an Eggrobo being an unlockable character in Sonic R, and a group of five modified Eggrobos, known as the Hard-Boiled Heavies, which appear as bosses throughout Sonic Mania. Eggrobos appear as enemies. They hover in the air keeping their distance from the player, and are hard to hit directly. They attack by shooting energy projectiles: either three energy bullets which can be reflected and absorbed, or a thin and continuous beam. This page was last edited on November 13, 2018, at 19:20.